This chapter aims to close the gap between the theory and practice of Dynamic Adaptive Planning (DAP). It (1) presents an operationalization of DAP using experts in a workshop setting, (2) applies this operationalization to a real-world policy problem involving a traffic safety technology called intelligent speed adaptation (ISA), and (3) presents both the resulting dynamic adaptive plan and the experiences of the participating stakeholders in designing the plan. The workshop was conducted with stakeholders who were likely to actually participate in the planning process for ISA in the Netherlands. In an assessment of the workshop, the participants concluded that the adaptive plan that was developed is a promising step toward the large-scale implementation of ISA in the Netherlands, and that DAP is a useful approach for dealing with deep uncertainty. DAP lacks realistic examples of real-world policy problems. (Most cases that are published were developed as hypothetical illustrations of DAP). DAP can be defined as a ‘high-level concept, captured in a flowchart’ (Kwakkel 2010). There is limited insight into the tools and methods needed to design an adaptive plan in practice that can be used in the various steps in the flowchart. A first indication of these is given by Swanson et al. (2010). But this overview is still very broad and needs to be operationalized. In order to develop and test DAP, a real-world decisionmaking problem involving deep uncertainty was needed. The case we selected was the implementation of a type of innovative traffic safety technology in the Netherlands. For decades, technical systems have been available that make sure a driver cannot exceed the legal speed limit. If these ‘intelligent speed adaptation’ (ISA) devices would have been implemented years ago, hundreds of thousands of lives worldwide could have been saved. (For example, the Swedish National Road Administration has suggested that ISA could reduce crash injuries by 20–30% in urban areas (see https://trid.trb.org/view.aspx?id=685632).) One barrier to the implementation of ISA is the uncertainty that still exists regarding the effects of (large-scale) ISA implementation (e.g., uncertainty about the acceptance of ISA, and liability in case of the system malfunctions) (van der Pas et al. 2012a). Although policymakers recognize the uncertainties that are involved in implementing ISA, their reaction is usually to initiate more research. Around 2010, Dutch policymakers developed an ISA implementation plan that was focused on implementing the appropriate ISA for the appropriate type of driver. 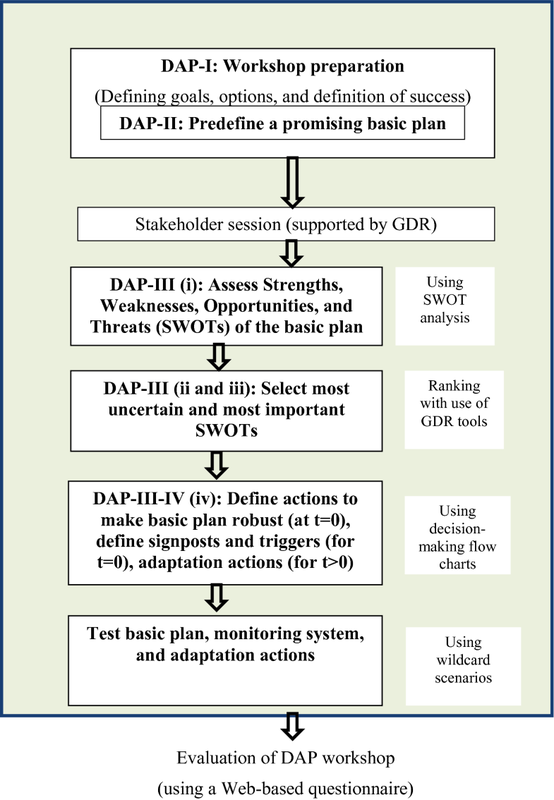 This implementation plan was redesigned as an adaptive plan at a workshop by policymakers, domain experts, and stakeholder representatives, using DAP concepts. In this chapter, we discuss the design and results of this DAP workshop. In addition, we present an evaluation of the workshop by the participants. Every day, people in Europe and other parts of the world are confronted with the grim reality of losing loved ones due to traffic accidents. The World Health Organization (WHO) estimates that every year over 1.2 million people die in traffic accidents and up to 50 million suffer non-fatal injuries (WHO 2015). This means that each day over 3000 people die, which comes down to more than 2 every minute. Research has shown that ‘excessive and inappropriate speed is the number one road safety problem in many countries, often contributing as much as one third to the total number of fatal accidents’ (OECD 2006). Speeding not only influences the risk of getting involved in a traffic accident, it also affects the outcomes of an accident. For the Netherlands, it has been estimated that if all motorists were to comply with the legal speed limit using ISA, it would reduce the number of accidents resulting in injury by 25–30% (Oei 2001). To address speeding behavior, a wide range of policy alternatives have been considered in the past. These measures (speed management measures) are often categorized using the three E’s: engineering (related to both vehicle and infrastructure), education, and enforcement. Examples of infrastructure engineering to reduce speeding are speed bumps and roundabouts. Replacing crossings with roundabouts has been shown to reduce the number of crashes with injuries or fatalities significantly (Elvik 2003). In driver education, novice motorists are familiarized with the effects of speed. In the Netherlands, a mandatory educational program for speed offenders is a possible penalty. Enforcement has also proven to be an effective measure against speeding. Stationary speed enforcement alone is estimated to have reduced the number of accidents by 17%, and speed cameras are estimated to have led to a reduction of 39% in fatal accidents (Elvik and Vaa 2009). In addition, a series of effective enforcement measures have been applied in the past, such as trajectory control and undercover surveillance. History, however, shows that the engineering category of measures in vehicle design is underused: Vehicle design is usually focused on making the vehicle faster instead of making speeding more difficult. For example, research from Sweden shows that the average top speed of all newly sold passenger vehicles in Sweden has increased significantly over the past decades, increasing from 153 km/h in 1975, to 172 km/h in 1985, to 194 km/h in 1995, and to over 200 km/h in 2002 (Sprei et al. 2008). So, the trend in vehicle engineering is not so much to reduce the possibility of exceeding the speed limit, but to enable the driver to drive faster. In-vehicle systems that assist the driver in the task of driving the vehicle are called ‘advanced driver assistance systems’ (ADAS). An example of an ADAS that is designed to assist the driver in choosing the appropriate speed is ‘intelligent speed adaptation’ (ISA). Advisory—Display the speed limit and remind the driver of changes in the speed limit. Voluntary (“driver-select”)—Allow the driver to enable and disable control by the vehicle of maximum speed. Mandatory—The vehicle is limited to travel at or below the speed limit at all times. Fixed: The vehicle is informed of the posted speed limits. Variable: The vehicle is additionally informed of certain locations in the network where a lower speed limit is implemented. Examples could include around pedestrian crossings or the approach to sharp horizontal curves. With a variable system, the speed limits are current spatially. Dynamic: Additional lower speed limits are implemented because of network or weather conditions, to slow traffic in fog, on slippery roads, around major incidents, etc. With a dynamic system, speed limits are current temporarily. Since the early 1980s, the effects of ISA have increasingly been studied using different methodologies and data collection techniques, including traffic simulation, driving simulators, and instrumented vehicles. ISA has also been demonstrated in different trials around the world (e.g., Sweden, the Netherlands, the UK, and Australia). The conclusions from all these trials and research are unambiguous regarding the positive effect of ISA on driving speed and the calculated effects on traffic safety. For instance, Carsten and Tate (2005) estimate that fitting all vehicles with a simple mandatory ISA system, making it impossible for vehicles to exceed the speed limit, would reduce injury accidents by 20% and fatal accidents by 37% (see Table 8.1). Adding a capability to respond to real-time network and weather conditions would result in a reduction of 36% in injury accidents and 59% in fatal accidents. In general, it can be concluded that the more permissive the ISA, the less it affects speed choice behavior. Other studies have confirmed that ISA can significantly reduce speeding and improve traffic safety (Lai et al. 2012). Although speeding is a major internationally recognized policy problem, and ISA seems a proven technology that has the potential to significantly contribute to traffic safety, the obvious question that remains is: Why is it that ISA has not yet been implemented except for some advisory systems? Part of the reason is related to the various (deep) uncertainties surrounding ISA implementation, including ISA technology development (in terms of reliability and accuracy to function properly under all circumstances), the way motorists will comply with ISA support, the impact of large-scale ISA penetration on congestion and travel times, the liability in case of ISA malfunctioning, and the preferences different stakeholders have regarding ISA implementation (van der Pas et al. 2012a). So, policymakers are aware of the potential of ISA, but policymaking for ISA seems limited to supporting further research and development on ISA implementation. Policymakers are having trouble designing policies that deal appropriately with the uncertainties surrounding ISA implementation. There are many uncertainties that surround ISA implementation. Many of these are not Level 4 (deep) uncertainties (e.g., how the main mechanisms work is understood and the range of things that can go wrong is known). However, there is deep uncertainty about issues such as liability if the system fails, driver acceptance (willingness to use), the behavioral adaptation of ISA drivers and road users who do not have ISA, the effects of different implementation strategies, and the effects of a large-scale real-world implementation of ISA. One way of obtaining insights into these uncertainties would have been to initiate pilot projects and monitor their results. But, our research was begun shortly after the literature on planning for adaptation to handle deep uncertainty had begun to appear (Walker et al. 2001; Lempert et al. 2003). It was clear that traditional approaches, designed for lower levels of uncertainty, were not entirely appropriate for the higher levels. Given the urgency of the road safety problem, and the availability of new approaches for dealing with deep uncertainty, we decided to get insights into the risks associated with the implementation of ISA by using experts to apply one of the approaches to designing a plan in the face of deep uncertainty—Dynamic Adaptive Planning. Below, we elaborate on methods that could be used to facilitate each step in practice. In Step I and Step II, the activities carried out to determine an initial plan are essentially the same as those carried out in choosing a policy in a traditional policy analysis study (see Walker 2000). Step I is the stage-setting step. It involves the specification of objectives, constraints, and available policy alternatives. This specification should lead to a definition of success, in terms of the specification of desirable outcomes. In Step II, a promising initial plan is identified based on a traditional, ex-ante evaluation of the alternatives identified in Step I. There are many well-established methods that can be used to screen the alternatives, including cost-benefit analysis (Sassone and Schaffer 1978), multi-criteria analysis (French et al. 2009), and balanced scorecards (Kaplan and Norton 1993), combined with the results from forecasts, scenarios, models, etc. Seizing actions (SZ)—Actions that take advantage of certain (or very likely) opportunities that may prove beneficial to the plan. Shaping actions (SH)—Actions taken proactively to affect external events or conditions that could either reduce the plan’s chance of failure or increase its chance of success. Techniques that use (computational) models. Examples include sensitivity analysis (Saltelli et al. 2001), Scenario Discovery (SD) (Bryant and Lempert 2010), and Exploratory Modeling (EM) (Bankes 1993; Agusdinata 2008). These techniques can be used to identify vulnerabilities and opportunities by varying model inputs across the range of plausible parameter values (Kwakkel et al. 2012) or by exploring outcomes across alternative models of the system of interest (Bankes 1993; Agusdinata 2008). Techniques that support experts in the process of identifying assumptions, vulnerabilities, and opportunities. Several examples are included in Sect. 3.2. In this case, we used strengths, weaknesses, opportunities, and threats (SWOT) analysis (Osita et al. 2014), and threats, opportunities, weaknesses, and strengths (TOWS) analysis (Weihrich 1982). Once the vulnerabilities and opportunities related to the initial plan are identified, these should be assessed in terms of their level of uncertainty (is the vulnerability certain or uncertain), in order specify the type of appropriate action (mitigating or hedging) to take. (If the uncertainty is certain or very likely, take it right away; if it is uncertain, make it a contingent action.) Typically, this ‘uncertainty rating or ranking’ is very subjective. The second part in Step III (increasing robustness) requires that specific actions are specified. Dewar et al. (1993) mention five methods for identifying these actions (all of which can be used in a workshop setting): (a) using relevant theories of causation, (b) using historical and comparative experiences, (c) using creativity, (d) using scenarios, and (e) using insurance or regulatory requirements. However, their report does not show how to identify the appropriate actions in a structured and integrated way. SWOT analysis and TOWS analysis can be used to fill this gap. The SWOT analysis reveals the strengths, weaknesses, opportunities, and threats; TOWS then uses the SWOT analysis as input to identify suitable actions in light of the SWOT results. In Step IV, a monitoring system is designed, and conditions suggesting that a change in the plan is needed (in order to save it from failure or increase the chances for its success) are specified (these are called ‘triggers’). The monitoring system tracks the development of the uncertain vulnerabilities of the initial plan (the developments that are being tracked are called ‘signposts’). Levels of the signposts beyond which the objectives of the plan will not be reached (the triggers, also known in the DMDU literature as adaptation tipping points) are predefined, and appropriate responsive actions are specified (these are designed in Step V). Several techniques can be used to design a monitoring system. Recently developed techniques that can be used for defining trigger values are based on Exploratory Modeling and Analysis (Agusdinata 2008), Scenario Discovery (Bryant and Lempert 2010), and a technique described by Botterhuis et al. (2010), which combines the detection of weak signals with scenarios. Once the adaptive plan has been designed, the results from Steps I–IV are implemented and the contingent actions (Step V) are prepared. The implementation process is suspended until a trigger event occurs. Steps I and II used the actual ISA implementation strategy of the Dutch Ministry of Transport (as specified in interviews with policymakers and internal policy documents of the Ministry). This made it possible for the Dutch policymakers to use the generated information in their everyday jobs, and it allowed for an ex post assessment comparison (in a few years) of the actual plan with the adaptive plan that they had designed. Identify a ‘top 10’ for each SWOT category (ranking using the GDR). Score the items in these top 10’s on their uncertainty and importance for the outcomes of the initial plan (scoring items on a five-point scale). Define actions, signposts, and trigger values for the vulnerabilities and the opportunities for the high uncertain/high-impact items (TOWS uses the SWOT analysis as input and translates the outcomes of the SWOT into actions). The workshop was held in December 2010. For the workshop, we invited representatives of most of the important actors for ISA implementation in the Netherlands (Walta 2011), resulting in 18 participants. The participants included policymakers (4), scientists (7), consultants (5), an ISA system developer (1), and an insurance specialist (1). So, most of the important actors for ISA implementation were represented (at least one representative of each important group was included). Each of the respondents had over six years of work experience (the majority had over 10 years of experience). The compliant driver: This type of driver has the intrinsic motivation to stick to the speed limit. Their ISA would be only a speed alert. Implementation would primarily involve an education campaign. The less compliant driver: This type of driver lacks the intrinsic motivation to stick to the speed limit. They would get to choose the type of ISA to be used. Incentives would be offered by insurance and lease companies. The notorious speed offender: Under the current regime, this type of driver would lose his or her driver’s license (and would be obliged to follow a traffic behavior course). In place of these draconian measures, they would be forced to use restricting ISA. A pilot test would be undertaken to provide information on how well the plan might be expected to work. The implementation of ISA would consist of two phases. Phase I would run up to the end of 2012. In 2013, a still undefined Phase II would start. During the workshop, the participants were asked to reflect upon this initial plan. The participants identified several vulnerabilities and a few opportunities related to the initial ISA plan shown in Table 8.2. Some of these vulnerabilities and opportunities could be addressed at the time the plan was implemented—i.e., the initial plan could be made more robust. Table 8.3 presents an overview of these vulnerabilities and opportunities and the actions that could be taken to improve the robustness of the initial plan. For example, ‘the availability of an accurate speed limit database’ was considered a certain high-impact weakness. Speed limit data must be correct for the right time (dynamic), the right location, and the right vehicle. The participants discussed whether they should deal with this vulnerability right away, or whether they could wait until a predefined situation occurs (i.e., a trigger event). They decided that it is important to immediately deal with this uncertainty (so they followed the arrow down in the decisionmaking flowchart in Fig. 8.2). The availability of an up-to-date database was considered to be either a certain or uncertain vulnerability. The participants next discussed its uncertainty level and decided that while the effects of incorrect speed limit data are very uncertain, it is fairly certain that this vulnerability will occur. They therefore filled in the box at the bottom of Fig. 8.2 (indicating the need for mitigating actions). Reassessment (RE)—A process initiated when the analysis and assumptions critical to the plan’s success have lost validity (i.e., when unforeseen events cause a shift in the fundamental goals, objectives, and assumptions underlying the plan). Table 8.4 shows the direct results from the workshop. Further operationalization of the signposts and related trigger values would be required to develop a monitoring system. For instance, consider the case of the second vulnerability mentioned: ‘the availability of an accurate speed limit database.’ The signpost suggested by the participants is: ‘level of accuracy/reliability of speed limit database.’ The next step would be to assign specific trigger values to the actions. For instance, if the accuracy of the speed limits in the database drops under a prespecified level of accuracy (e.g., 97%), a defensive action should be triggered, and additional effort should be taken to make the speed limit database more accurate. If the accuracy drops below an even lower level (e.g., 60%), a corrective action should be taken (i.e., the initial plan should be changed) as follows: ‘Stop implementation of certain types of ISA or combine with on/off switch and overruling possibilities.’ The specific trigger values would have to be determined (e.g., by using literature or additional modeling efforts). After ISA is implemented, hackers develop ways to mislead the ISA systems, allowing people to speed without the system noticing. Current ISA systems use the USA satellite system to determine their position. The Americans ‘play’ with the accuracy of the system. In times of war, the system is more accurate than in times of peace and less accessible to civilians. In 2013, the USA is no longer at war and the accuracy is reduced. After 2013, the system becomes so inaccurate that safety issues arise. What would happen to the (road) transport system? What would happen to your adaptive plan, and how would the outcomes of the plan be influenced if this scenario were to occur? Is your adaptive plan capable of dealing with this scenario? These wildcard scenarios led to interesting (and lengthy) discussions. A total of nine wildcard scenarios were assessed. In six cases, the groups indicated that their plan was capable of dealing with the wildcard scenario. Open questions asked of the participants in a follow-up questionnaire revealed that they appreciated the wildcard scenario portion of the workshop, and they stressed the added value of these scenarios. In addition to the above assessment of workshop outcomes, we also used a (Web-based) questionnaire to elicit the participants’ opinions on the DAP approach. The main results are displayed in Table 8.5. As can be seen from the table, the participants were very positive about the suitability and usefulness of adaptive plans (#1, 2, and 5). They thought that the elements of the adaptive plan (actions, monitoring system, etc.) and the process of designing and implementing a plan would be useful for ISA implementation in the Netherlands (#3, 7) and that policymakers were capable of using the process (#6). However, they agreed that the process of developing and implementing such a plan was more time-consuming than that required for a traditional static plan (#4). For an in-depth analysis of the results from the questionnaire, and an overview of the complete evaluation, see van der Pas et al. (2012b). By using a structured, participatory approach to developing a dynamic adaptive plan, we addressed the issues and challenges mentioned in Sect. 8.1. We used SWOT, TOWS, a group decision room, wildcard scenarios, decisionmaking flowcharts, etc. In addition, we tested this approach in a workshop with experts, stakeholders, and policymakers and evaluated it by canvassing the opinions of the workshop participants. We found that the workshop approach we used is promising and can produce a usable adaptive robust plan. However, we found that better ways are needed to identify the signposts and trigger values. This information could come from the use of other methods. A promising technique to do this might be Scenario Discovery (SD) (Bryant and Lempert 2010). Future applications of SD in the context of DAP can prove useful in identifying signposts and trigger values. Hermans et al. (2017) also provide some useful suggestions for designing monitoring arrangements. Several further lessons were learned from the workshop and subsequent feedback. First, some decisions need to be taken before starting to design an adaptive plan. These are often related to the political process (e.g., the decision to use an analytical approach) and to educating the policymakers (e.g., the design of an adaptive plan might be costly and time-consuming, and the concepts are new). During the workshop, the experts had trouble dealing with these issues. This problem can be prevented by increasing the involvement of the participants over time. Instead of one workshop plus assessment and questionnaire, a dedicated task force could be formed with the responsibility to formulate an advice to the decisionmakers. The major stakeholders would be represented in the task force. The task force would meet 3 times. The first meeting would focus on making an inventory of the level of knowledge and the questions the members have. The second meeting would be a workshop in which the largest knowledge gaps and questions are dealt with. The third meeting would be to design the adaptive plan. Second, the participants indicated that a vulnerability or opportunity is often neither 100% certain or uncertain. Although implicit in the DAP framework, it is not necessarily true in practice. An action can be assessed to be both fairly certain in some respects and uncertain in others. Consider, for instance, the vulnerability ‘the ISA technology can fail; location determination can be inaccurate.’ It is fairly certain that this will occur. However, one stakeholder judged this as uncertain, because the magnitude of the effects if it occurs is uncertain. So, one might want to define both a mitigating action (e.g., provide a warning to the driver when the system fails) and a reassessment action (in case fatalities with the system occur). Distinguishing between the uncertainty of occurrence and the uncertainty of impact when it occurs is an important distinction that should be made when developing adaptive plans. Third, after the assessment of vulnerabilities and opportunities, a choice can be made whether to handle a specific vulnerability or opportunity through actions to be taken immediately or in the future in response to a trigger event. An assessment of the costs of both approaches is required to make a reasoned choice. No clear guidance on how to choose between taking immediate action or preparing for the future currently exists. Related to this, it proved to be impossible to specify trigger values during the workshop. This was not due only to practical time constraints, but also because defining trigger values involves very specific expertise and knowledge. A possible solution to this problem could be to introduce a fast simple transport model (FSM) into the workshop. This would allow for running simulations during the workshop in order to determine trigger values (FSMs are used in SD and EM). This solution was prototyped in a project related to the Colorado River, which was documented by Groves et al. (2016). They did this by reconvening a panel of experts at Lawrence Livermore Laboratory and going once more through the deliberative process, this time with the underlying exploratory models being operated and producing the required analyses in real time. Fourth, although the initial plan distinguished three types of motorists (compliant, less compliant, and notorious speeders), the analysis showed that the vulnerabilities and opportunities mostly address either the notorious speeders or the overall initial plan (without distinguishing among the other types of motorists). This indicates that experts may find it difficult to assess a plan that consists of multiple alternatives (they might not address each alternative consistently). In the workshop, we had the impression that the experts focused on the underlying assumptions and tried to find vulnerabilities and opportunities for these (e.g., ISA should be a reliable technology, and for a GPS-based ISA, an accurate speed limit database is required). As a result, they came up with more generic vulnerabilities. Later, these would have to be translated into specific vulnerabilities for each of the alternatives for each of the target groups for which the plan is to be applied. Previous literature suggested that, conceptually, DAP is a promising policy design approach that is able to handle deep uncertainties. However, it also pointed out some major remaining challenges. Three of these challenges were addressed in this case. First, DAP lacked examples of adaptive plans developed by policymakers or domain experts. By designing an adaptive plan with policymakers, domain experts, and other stakeholders, we showed that policymakers are capable of designing dynamic adaptive plans. Second, DAP lacked well worked out examples of real-world policy problems. By using DAP to design an actual ISA implementation plan with policymakers, domain experts, and other stakeholders, we showed it can be used to address a real-world policy problem. In addition, the experts indicated that the plan could be used to encourage and speed up real-world implementation of ISA in the Netherlands. Third, DAP was previously a high-level concept, captured only in a flowchart, yielding only limited insight into its operationalization. By designing, applying, and evaluating a workshop, we showed how DAP can be operationalized by integrating existing research methods into an integrated design approach. Moreover, the process revealed problems that can be expected in doing so. The framework seems to be ambiguous regarding the moment of implementation. In particular, the participants had trouble defining when some of the actions should take place. (For example, certain required actions had to be taken before the adaptive plan could even begin to be implemented. These mainly related to the political process and to the perceived time and cost involved in designing and implementing a plan using DAP). Participants had trouble dealing with the fact that a vulnerability or opportunity is not either certain or uncertain (which influences the type of action that needs to be defined). There is a scale between certain and uncertain, so an action can be assessed by participants to be both fairly certain in some respects and uncertain in others. In addition, although DAP is selected because the decision problem at hand is considered deeply uncertain, this does not mean that every aspect of the decision problem is uncertain. It is important for the participants to have a clear picture of which dimension of deep uncertainty is being addressed. In terms of the definition given by Lempert et al. 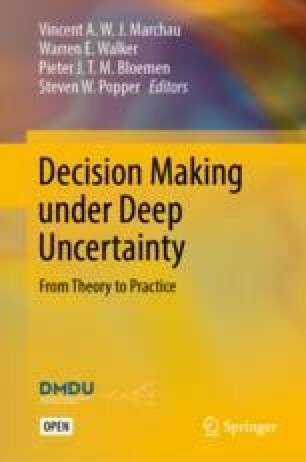 (2006), we distinguished three dimensions: deep uncertainty regarding the appropriate model, (2) deep uncertainty regarding the prior probability distributions for inputs to the model and their interdependencies, and (3) deep uncertainty regarding the stakeholder preferences that can be used to rank policy alternatives. Participants need to have a clear picture of what aspect of these dimensions is being addressed by each of the vulnerabilities and opportunities. Methods to indicate the dimensions of deep uncertainty could be useful here. For each of the vulnerabilities and opportunities, a choice can be made whether to handle these through actions to be taken immediately (an initial action) or in the future in response to a trigger event (a contingent action). Participants struggled to find criteria that could be used to resolve the timing of the actions. Experts had trouble dealing with the fact that the initial plan was a package of actions. 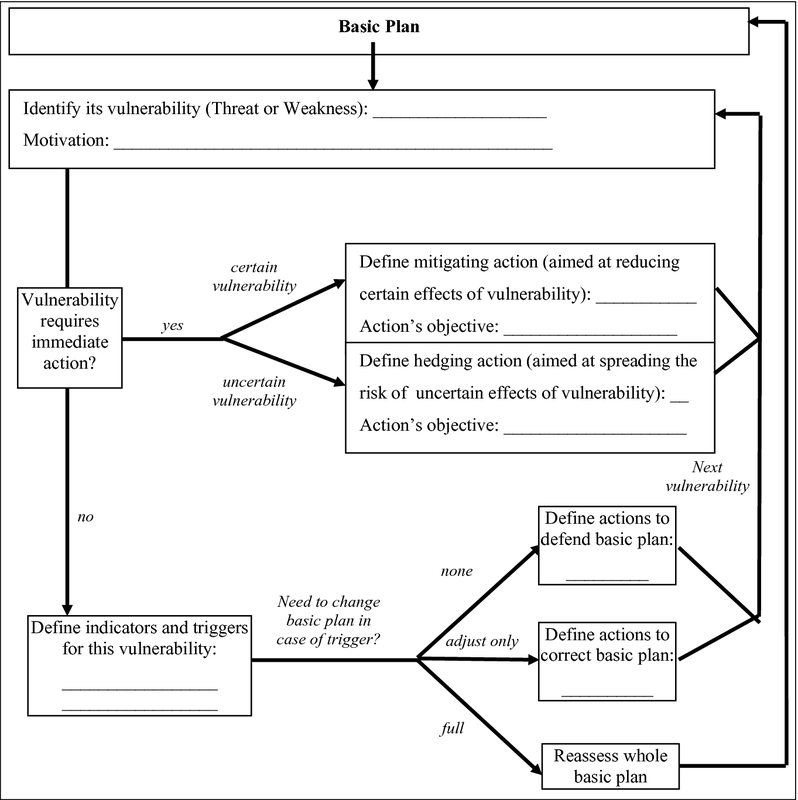 Going through the process of defining vulnerabilities and opportunities, signposts and trigger values, and contingent actions for each of the actions in the initial plan proved a challenge. As a result, they did not address each of these actions consistently. This is likely due to the setup of the workshop. Future workshops should include mechanisms to deal with policy packages more effectively. All of these issues should be addressed in work aimed at improving the DAP approach. With regard to ISA, the work confirmed the hypothesis that DAP is a useful approach for dealing with the uncertainties related to its implementation. Traditional/current ISA policies involve either ‘do nothing’ (no ISA) or ‘do the wrong thing’ (e.g., ISA for everybody). DAP enables policymakers to begin implementation, to monitor developments, and to adjust the plan based on real-world developments that cannot be predicted. Groves, D. G., R. J. Lempert, D. W. May, J. R. Leek, and J. Syme (2016). Using high-performance computing to support water resource planning: A workshop demonstration of real-time analytic facilitation for the Colorado River Basin, RAND Corporation and Lawrence Livermore National Laboratory, CF-339-RC, 2016. Retrieved December 30, 2017 from https://www.rand.org/pubs/conf_proceedings/CF339.html.